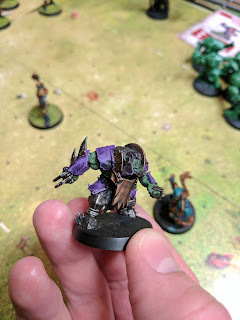 Here's my test model for the Orc team (name TBD). Anyway, we had all this great backstory and fluff about their altered genetics and sequence of events that led to this new breed of Ork. I'll try to dig up more of the details as it was fun stuff and I know I still have 20-30 red skinned Orks packed away somewhere. 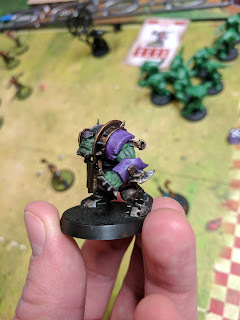 I thought about drawing inspiration from the old Red Ork project for my new Blood Bowl Orcs but ultimately decided on a more traditional scheme as I've got plenty of red to paint with my Khorne Warband on the horizon. After deciding on the green skin, I knew I wanted purple as a predominate color for the armor so I started testing out various shades trying to come up with a quick and easy recipe. 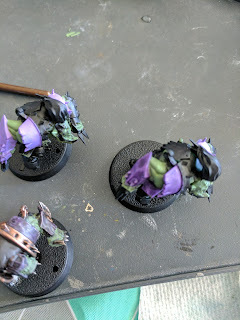 My first couple iterations were neither quick nor easy but I finally got it down to a base layer of Genestealer Purple (left Blitzer) with heavy washes of Leviathan Purple (right Blitzer). Doesn't get any easier than that! It's not perfect but it's quick and that's what I'm going for with the Orc team.